The voyage made by GUIDO DE LAS BAZARES, to discover ports and bays on the coast of Florida, for the safety of the troops to be sent there, in the name of his Majesty, PHILIP II., King of Spain, under the orders of Don LUIS DE VELASCO, Viceroy of Mexico, 1558. IT was about four or five months ago that Don LUIS DE VELASCO, Viceroy of Mexico, ordered, in the name of his Majesty, PHILIP II., King of Spain, GUIDO DE LAS BAZARES to proceed with the marines and other persons to explore the coasts and harbors of Florida, for the greater safety of all persons who should go there, in the name of his Majesty, to colonize Florida. He was accordingly commissioned, and ordered to set sail from the port of San-Juan-de-Lua, New Spain, on the 3d of September, 1558, to explore the coast of Florida, with a large bark, galley, and shallop, manned with sixty seamen and soldiers. On the 10th of September, he arrived atPanuco, and from thence he departed, and arrived on the coast of Florida, in 27½ degrees of north latitude. Continuing along the coast, he discovered a bay in 28½ degrees north latitude, which he named San Francisco, and took possession of it in the name of his Majesty, and from thence to the Alacranes, the coast of which extends from north-west to south-east; but contrary winds having prevented him from approaching the coast where he desired, he landed in 29½ degrees of north latitude, and discovered an island, which was, perhaps, four leagues from the mainland; he passed within this island [supposed to be Dauphin, Bay of Mobile] and the mainland, and other islands, and after having explored all the coast, he observed that it was bordered by marshy grounds, and was not in a favorable situation to begin a colony, as it was liable to be submerged in many places; nevertheless, he took possession of the country in the name of his Majesty, and gave it the name of Bay of Bas-Fonde. From thence he sailed ten leagues further to the east, where he discovered a bay which he named Filipina,1 it being the largest and most commodious bay on the coast. The entrance is in 30½ degrees; and on entering the bay, he passed the point of an island [now called Santa Rosa] seven leagues long, and steered E.S.E. On the other side of the bay lies the mainland, which is, perhaps, half a league wide from point to point. Of all the discoveries made from east to west, there is no bay so accessible and commodious as this. The bottom is of mud, and the harbor is from four to five fathoms deep at low tide. The channel is three to four fathoms deep, and at high water near one fathom more. The climate is very healthy, and similar to that of Spain. It abounds in all kinds of fish and oysters. The pine forests are extensive, and can be used for ship-building. There are, besides, live oak, cypress, ash, palmetto, laurel, cedar, and other trees, one of which yields a fruit resembling the chestnut. All of these trees commence to grow near the shore, and extend for many leagues into the interior of the country. Small rivulets of water fall into the bay, where there is a large opening which appears to be the mouth of a great river. While in this bay, he went to examine the water on the north side, where the trees are not so dense, and where cavaliers might hold their tournaments, and find grass for their horses. In the rear of this bay, in an easterly direction, are high hills of a reddish clay, from which earthenware can be manufactured. Here can at all times be seen a great variety of wild game, such as eagles, turkeys, geese, ducks, partridges, doves, etc. 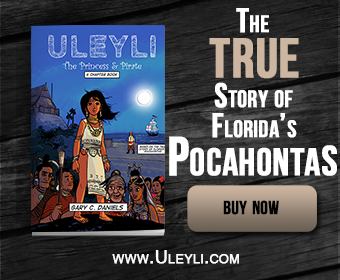 On the shores of this bay, he observed a large number of canoes which the Indians use when they go to fish and hunt game, as well as Indian huts, surrounded with maize, beans, and pumpkins. He took possession of this country in the name of his Majesty, which is distant about two hundred and sixty leagues from the port of San-Juan-de-Lua [Vera Cruz]. Contrary winds now prevented him from advancing any farther, although he returned twice to the bay of Filipina, which he afterwards named Velasco. As the winter was now approaching, the pilots and sailors were of the opinion the weather would not be favorable for further explorations of the coast, and he deemed it advisable to return to New Spain to report the discoveries he had made, with the intention of returning again to the coasts of Florida to make further discoveries. He accordingly left the coast on the 3d of December, and arrived at San-Juan-de-Lua on the 14th and herewith certifies that the above statement is a true account of what took place. And this declaration having been read to him, he has approved the same, and signed it with his name. CONSTANTINO OREJA DE SAN REMON. The above statement was made and read in presence of Father PEDRO DE FERIA, Vicar-General of the province of Florida; DOMINGO DE SALAZAR, his friend, and FRANCISCO DE AGUILAR, notary, who accompanied the expedition to the coast of Florida. To which is herewith added the following account of the voyage of Don ANGEL DE VILLAFANE, Governor and Captain-General of the provinces of Florida,2 that terminate at a point (on the Atlantic coast) called St. Helena (South Carolina), in 32 degrees north latitude. On the 27th of May, 1561, the Governor, with two frigates and a caravel, arrived at St. Helena (sound), and sailed up the river (Jordan) four or five leagues, and took possession of the country in the name of his Majesty CHARLES IX. ; but, not discovering a convenient port or land suitable for a colony, he returned to sea, and followed the coast in search of a port; and having doubled Cape San Roman (Fear), in 34 degrees north latitude, he landed on the 2d of June, and ordered a ship to make soundings, and found the bottom good; and from thence he went into the interior until he came to a large river which discharged its waters near the cape (San Roman), and took possession of the country and called it“Jordan,” and proceeded to sea. On the 8th of June, he returned and re-entered the river Jordan (St. Helena Sound), with two frigates, but, not finding a suitable harbor, he again returned to sea, and was annoyed with the discovery that the frigate San Juan had fouled her anchor, and lost it near Cape San Roman. He continued his exploration along the coast with two frigates, and sent the treasurer, Don ALONZO VELASQUEZ, with one of them to the river of Canoes (De las Canoas), in latitude 34½ degrees north, which he ascertained to be one and a half fathoms deep at one and a half leagues from its mouth. He afterwards rejoined the Governor, who continued to examine the coast until the 14th of June, when he reached Cape Trafalgar (Lookout), in 35 degrees north latitude. At ten o’clock at night, a tempest arose, and the caravel was near being lost, as well as both frigates. They were surrounded by shoals and a submerged coast, and, being far away from any port, the Governor and pilots decided to proceed on their voyage, until they reached the port of Monte Christo, in the island of Hispaniola, where the Governor landed on the 9th of July, 1561; and at the request of Governor Don ANGEL VILLAFANE, I, the undersigned notary, being informed of all the facts of the voyage made by him, have written the foregoing statement at the port of Monte Christo, St. Domingo, this tenth day of July, 1561. To which I affix the seal of my office to the original, this fifth day of May, 1565, and transmit the same to the King’s Council of the Indies. DON GONZALO PEREZ, Secretary of the Council of the Indies, at the same time he presented the above to the President, laid before him a memorandum from the King requesting the Council to give him their definition of the rights of the King to Florida, and whether the Frenchman can take possession of that country and build forts there. The Council informed the King that his title to the country of Florida is clear and indisputable, and founded on the gift of Pope ALEXANDER VI.,3 and the taking possession of that country by Governor-General Don ANGEL DE VILLAFANE, is the same country which the French have recently taken possession of and built a fort there called Carolin: and the same country which GUIDO DE LAS BAZARES took formal possession of in 1558; and which the fleets and ships of the King of Spain have at different times explored and taken possession of. 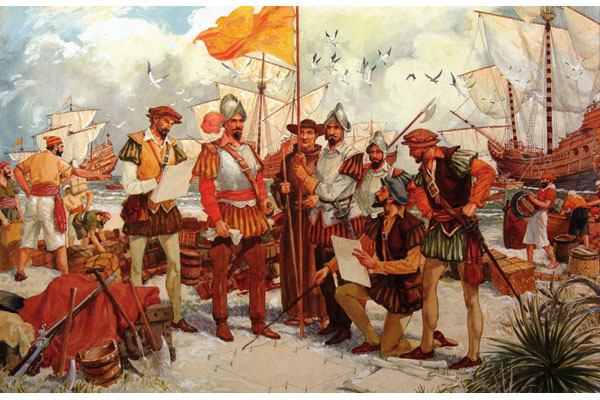 JUAN PONCE DE LEON was the first to discover and take south as far as Florida. While state policy and ambition were thus powerfully seconded by individual enterprise, the New World became the grand lottery of the Old. Spain and Portugal reacted upon each other in their successive discoveries; and now that COLUMBUS and VESPUCIUS had planted the Cross as the insignia of conquest and possession on many a barbarous coast in Africa and America, and though those unexplored countries may be thought to have lain too far apart to produce clashing interests, still they begot great international jealousies. And as Rome was still the Court of final appeal to Christendom, and the Pope the source whence all new rights of sovereignty were derived, the Pope was called upon by Spain and Portugal to decide this knotty question, and the famous ALEXANDER VI. issued in 1496 a bull of donation fixing as limits of partition a meridian drawn 100 leagues west of the Azores and Cape de Verd Islands; and assigned to Spain the dominion of all lands newly discovered, or to be discovered, as far as 180 degrees to the west of this line; and to Portugal all that lay within the same extent eastward of the meridian assumed. Neither England nor France, however, acknowledged any right in the Pope to make such magnificent gifts of unknown territory, and sent out expedition after expedition to make discoveries without asking leave of his Holiness. And as neither Spain nor Portugal questioned the inherent right of the Pope to gift the world to them as a theater for plunder and spoliation, the limits of partition became a long and fertile subject of difference between themselves and others. 1. The present Bay of Pensacola, sometimes called by the Indian name, Ochuse (Hoch’ Ushi, Choctaw), or Uchuse by Spanish navigators in the sixteenth century. It was discovered by MALDONADO, one of DE SOTO’S officers; and is about eleven miles from the Gulf of Mexico. 2. Sent out by Don FRANCISCO DE GARAY, Viceroy, of Jamaica, with instructions to make an examination of the coasts of Florida. 3. In 1496, the English, emulous of the discoveries and maritime glory of Spain and Portugal, and indifferent to the Pope’s charter of donation, fitted out an expedition under letters patent from HENRY VII. to JOHN CABOT and his three sons, to seek for a western passage, to the north of the new Spanish discoveries, to Cathay (India.) In the prosecution of this scheme, the CABOTS discovered Newfoundland, and probably explored the coast of North America possession; after him, LUCAS VASQUEZ DE AYLLON; and after him, PANFILO DE NARVAEZ; and after NARVAEZ, HERNANDO DE SOTO. All of whom, and many others, were commissioned by your Majesty to explore and take possession of Florida. And therefore the French have no right to interfere, as they might hereafter build forts, interrupt commerce, and capture the ships of your Majesty coming from the Indies.